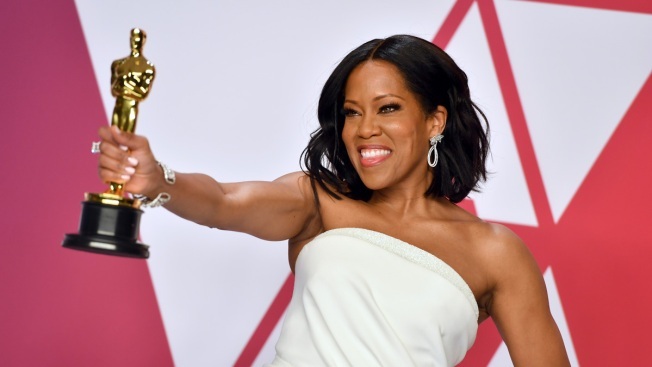 Regina King poses with the award for best performance by an actress in a supporting role for "If Beale Street Could Talk" in the press room at the Oscars on Sunday, Feb. 24, 2019, at the Dolby Theatre in Los Angeles. Regina King's flowing gown nearly tripped her up on the way to collect her Oscar trophy, the actress' only misstep this award season. King was honored as best supporting actress for "If Beale Street Could Talk" at Sunday's ceremony, a final flourish to a run of victories including a Golden Globe trophy, Independent Spirit award and numerous honors from film critics' groups. King, who gave an impassioned acceptance speech at the January Globes calling for equal opportunity for women in Hollywood, paid tribute at the Oscars to her mother, God and the writer whose work was the basis for "If Beale Street Could Talk." "To be standing here, representing one of the greatest artists of our time, James Baldwin, it's a little surreal," an emotional King said. She lauded the late Baldwin for birthing the story and writer-director Barry Jenkins for nurturing and surrounding it with "so much love and support." "So it's appropriate for me to be standing here, because I'm an example of what it looks like support and love is poured into you," she said. King switched her attention to her beaming mother, who had accompanied her to the ceremony. "Mom, thank you for teaching me that God is leaning, has always been leaning, in my direction," King said, concluding her speech with "God is good, all the time." Amy Poehler, one of the presenters of King's trophy, offered her more kudos backstage: "What an amazing speech by Regina," Poehler said. King's heels caught in her gown as she started to take the stage. Coming to her rescue: Chris Evans, aka Captain America, who helped steady her as she got untangled. The other nominees in the supporting actress category were Amy Adams for "Vice," Marina de Tavira with "Roma" and Emma Stone and Rachel Weisz for "The Favourite." Associated Press writers Andrew Dalton and Lindsey Bahr contributed to this report.